Frank was the son of Supplina and Sarah Jane (Sumpter) Hamilton. Aletha was the daughter of Greenberry Shields Templeton and Nancy Jane McCarty. Their children are listed as: Glenn ( 17), Fern (16), Floyd (14), Harry (12), Gaylord (10), Charles (3) and Carl (10 months). Greenberry Shields Templeton and his third wife Lizzie were living and farming near Wallowa in Wallowa County in Northern Eastern Oregon State. Greenberry was the father of Julia Aletha 'Letha' (Hamilton) Templeton and Laura Annettie 'Nettie' (Hamilton) Templeton who married Judd and Frank Hamilton respectively, the sons of Supplina and Sarah Jane (Sumpter) Hamilton. 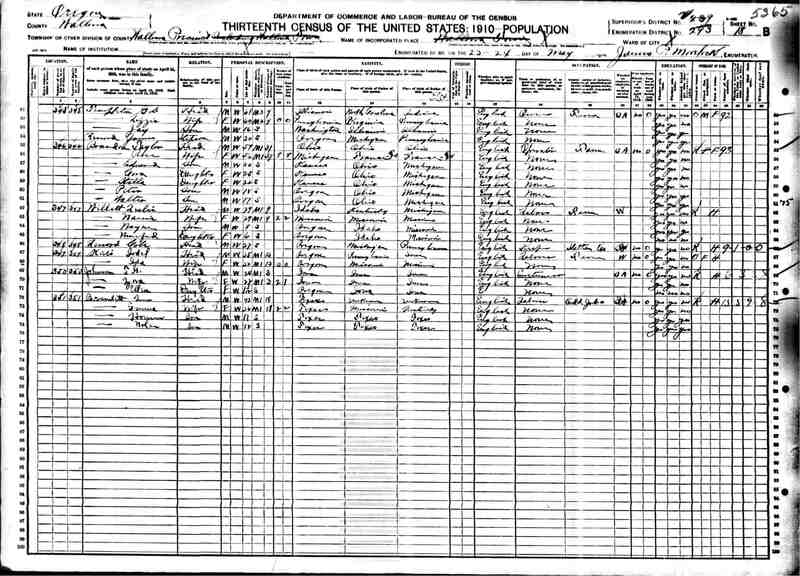 In their household in May of 1910 were Greenberry (age 61), Lizzie (age 60), a stepson James Brussard(?) (age 20) and a son Jay (age 16). Judd and Annettie (Templeton) Hamilton were living and farming outside of St. John, WA right next to Charles Calvin 'Cal' Jr. and Ida (Hamilton) Cole. Judd and Ida were children of Supplina and Sarah Jane (Sumpter) Hamilton. Judd (37) and Annettie's (35) children were, Wilber R(oss) (15), Supplina W(ard) (13), Maurice L(ake) (9) and Dora L (5). 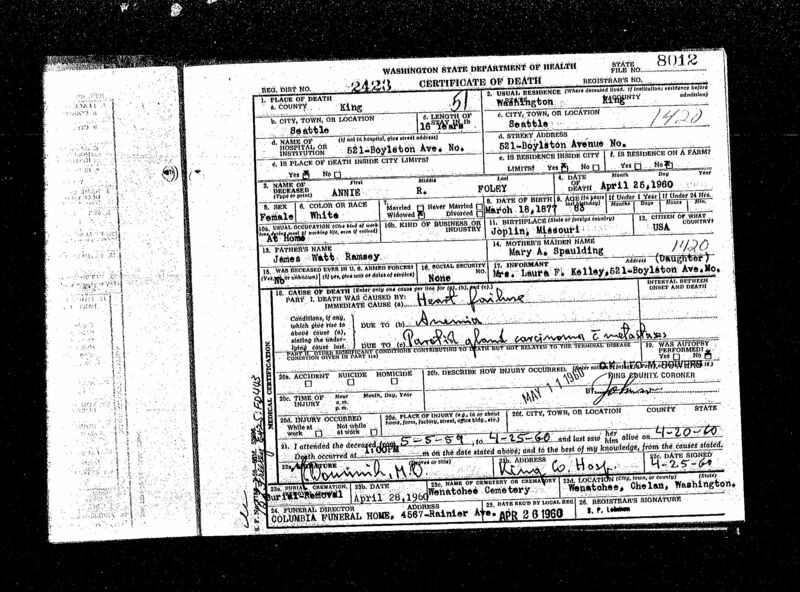 Cal (35) and Ida's (30) children were listed as: Vira G. (9), Else M. (7) and Dorothy M. (10 months). 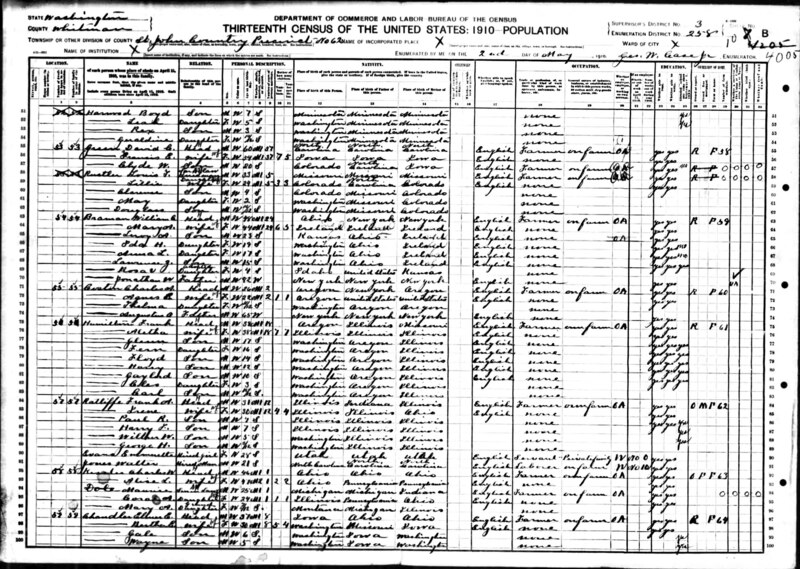 Charles Galloway was the father of Elsie Luetta Galloway who married Maurice Lake Hamilton in September of 1920 in Okanogan, WA. ay Perkins Templeton was the son of Greenberry Shields and Hattie Templeton and the half brother of Julia Aletha 'Letha' (Hamilton) Templeton and Laura Annettie 'Nettie' (Hamilton) Templeton. 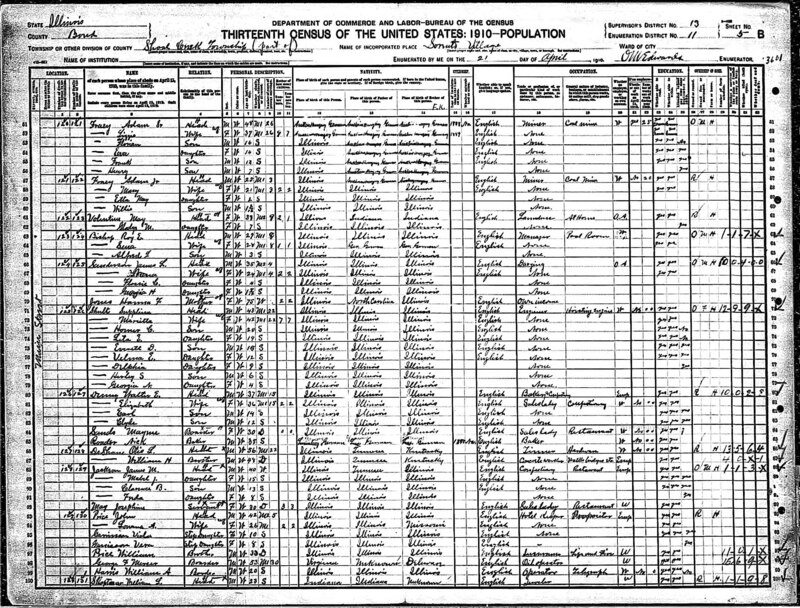 In the 1930 US Census he is 36 and living with his in-laws, Albert and Janett Daniels, in Wallowa, Wallowa County, Oregon. Jay's wife is 29 year old Gayet. They have a son, Ronald age 9 and a baby daughter Marion (?) 4 months. His occupation is listed as Garage Attendant. 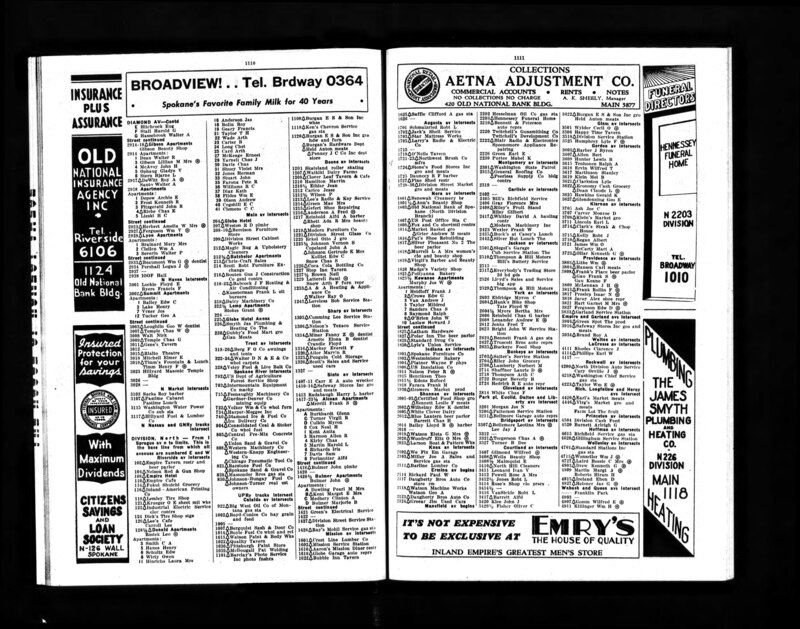 This is a page from the 1940 Spokane, Washington City Directory. It shows the Maurice & Elsie Hamilton family living at West 24 Nora Ave. This was just East of Division Street on the near North side of Spokane, WA. Maurice's father and mother, Judd and Annettie (Templeton) Hamilton were living nearby at West 11 1/2 Nora Ave. Maurice & Elsie's son Marvin Vernon Hamilton was living by himself in an apartment at N1210 Division Street, also near by. This directory entry captures a snap shop of our family living closely together in Spokane. The homes and apartment building are no longer there. Maurice and family would often speak of their time living together on Nora. It was here that their twins Arthur and Arlene Hamilton were children. 11) 1945/46 R.L. Polk Spokane City Directory - Marvin & Julia Hamilton - 1210 N. Division St.
James was the younger brother of Supplina Hamilton and the twin of William McCord Hamilton. It's not 100% clear the enlistment history of James. It appears he may have had one year in another outfit and then was discharged and transferred to the 85th Illinois Volunteer Infantry, Company C so he could serve along side his brother William who enlisted in the summer of 1862. From the documentation here it appears that James needed to reenlist in the 85th Infantry in 1864. The enlistments in this era were for three years. He had served one year in another unit and two years in the 85th. James was a 2nd Lieutenant when he reenlisted (in the heart of the war). He was subsequently captured during the battle of Peach Tree Creek, GA later that summer in July of 1864. He was released months later in a prisoner exchange. When he was discharged from Washington, DC at the War's end he held the rank of 1st Lieutenant... and was a true Civil War hero. James died an untimely death a few years later in 1869 near his home town of Mason City, Illinois. James was only 35 years old. During those years he had lived in the westward expansion of the country and the greatest national drama of our young nation. James apparently never married and had no children. This PDF document contains a couple pages from the work: "A History of Central Washington: including the famous Wenatchee, Entiat, Chelan and the Columbia Valleys" published in Spokane in 1929. At the bottom of page 234 begins a short biographical sketch of Osta H. (Hamilton) Stuckey of Wenatchee. Osta was born in Waitsburg the daughter of Duron Hamilton and Laura Brunton. In talking about Osta's pioneer heritage the story of her father is told and that of her grandfather Supplina Hamilton (though Supplina is not mentioned by name). The account of Supplina has inaccuracies (he was from Illinois not Iowa and he came West in 1851 not 1852) but it also reveals a new story that I've not heard anywhere else. If there is a core of accuracy to the story it would suggest some new interesting facts: 1) before Supplina entered the Yakima Indian War in 1855/56 as a Linn County, Oregon Volunteer Soldier (in the 1st Regiment of the Oregon Mounted Volunteers) he was working in NE Oregon among the Umatilla Indians as a missionary, 2) there is a story related of him running to a blockhouse to escape the initial attack of the hostile indians. I'm not convinced that the author got Osta's memories correct or that perhaps Osta had the chronology quite right. From all other sources we've assumed Supplina's missionary / preaching began after the war and sometime after he was married in 1858. Supplina and Jane did move to Umatilla County in June of 1861 and lived there until 1866. Supplina gave a detailed chronology of his residences on his Indian War pension papers and specifically mentioned he lived in Linn County until he moved to Umatilla in June of 1861. Anyway, the document is a very interesting short read. 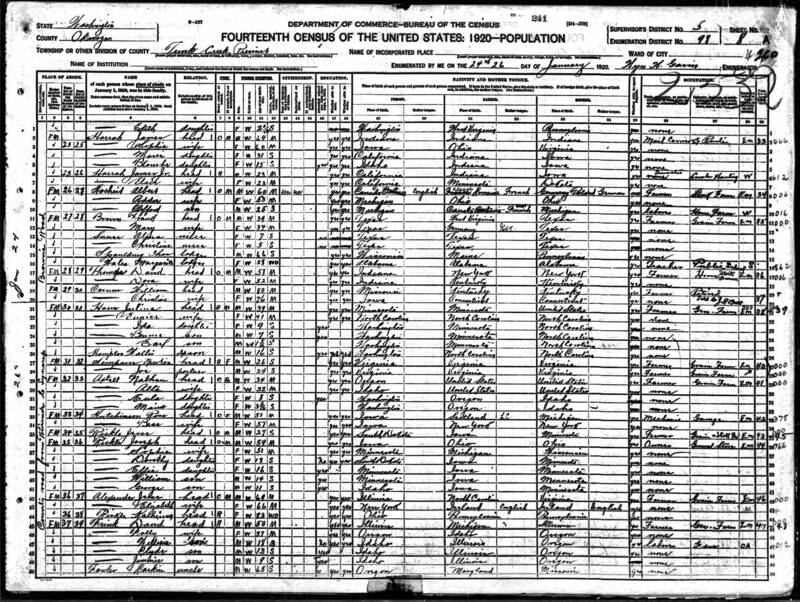 This birth return matter of factly records the stillbirth of a female child to Dora (Hamilton) and Jessie L. Shaw on the farm at Union Flat Creek in Whitman County, WA on Christmas Day, 1892. Dora was the 27 year old daughter of Supplina and Jane Hamilton. This would have been her 5th child. Abel Cross and Roxa Hamilton were married in Morgan County, Illinois on September 2nd, 1836. Roxa was the daughter of John and Altha (Judd) Hamilton. It is likely that both John and Altha were alive at this point. Overlay of Google Earth aerial photo showing the donation land claim of Supplina Hamilton #2969 near Linn County, Oregon. 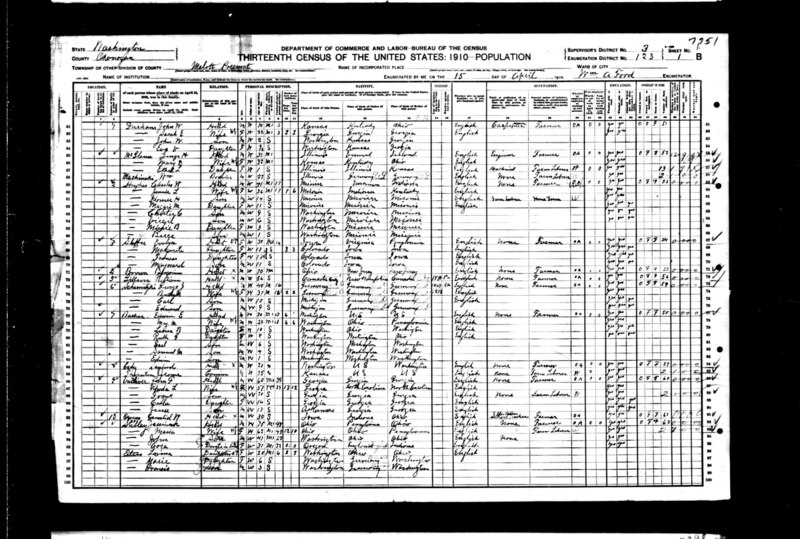 There are two Alexander Sumpters recorded on this 1900 Linn County, Oregon, Santiam Precinct US Census page. The elder Alexander (listed alone) is the father of Sarah Jane (Hamilton) Sumpter. He came across the Oregon Trail with his family in 1853. 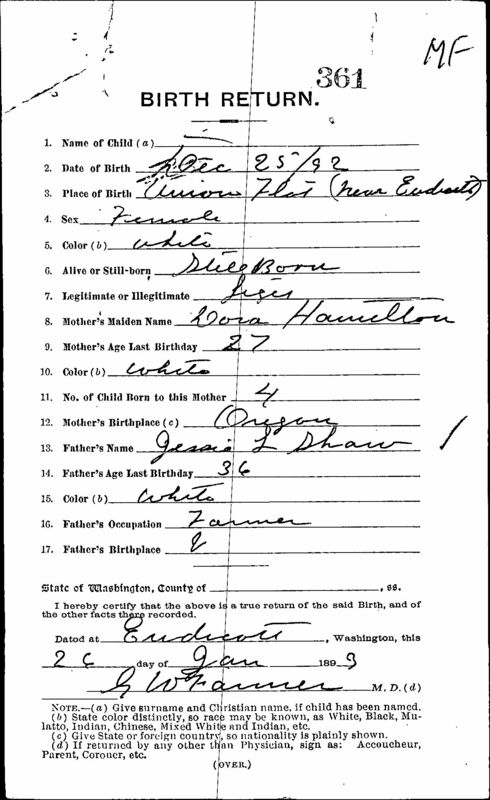 The younger Alexander is his son (born in Oregon in 1853) and family. It would appear that Alexander Sr.'s wife, Nancy (Prather), is deceased in 1900. Alexander is 90 years old. 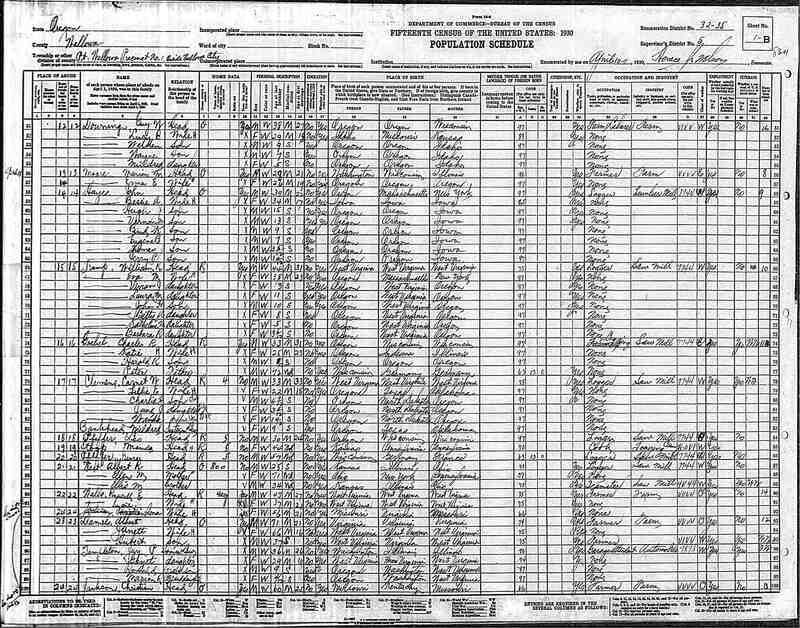 Alexander was born in Tennessee in 1810 and dies four years after this census in 1904. Alexander Sumpter was the father of Sarah Jane 'Jane' Hamilton the wife of Supplina Hamilton. 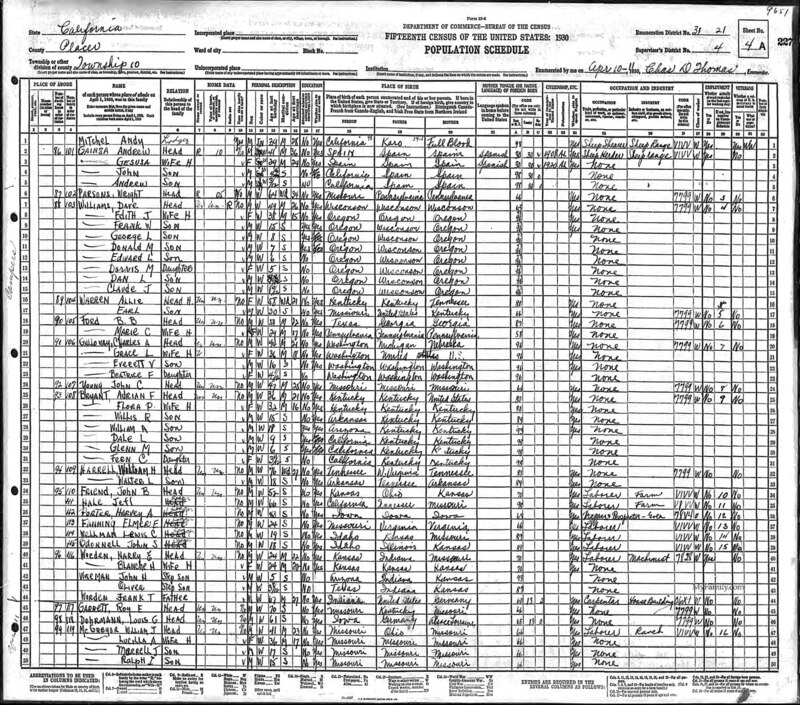 Alexander and wife Nancy had 13 children and over 270 decendants when he passed at away near Albany, Oregon at age 93. Altha was a daughter of Supplina Hamilton and Sarah Jane Sumpter. She was likely named for her grandmother (Supplina's mother), Altha Judd. She was married in her parent's home. This records appears to show that Amasa Galloway was sued by Hawley, Dodd and Company for collection on a promissory note, in 1881. Amasa was the father of Charles Galloway and the grandfather of Elsie (Galloway) Hamilton. 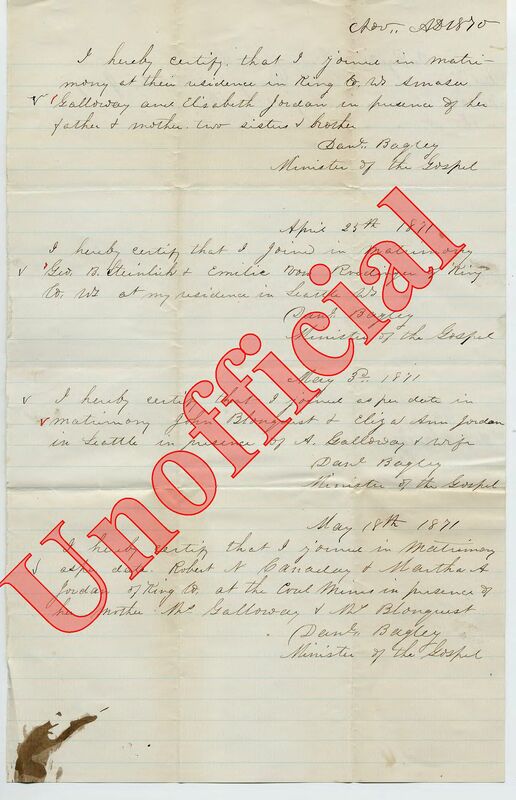 This record shows that Amasa was sued again in 1883 over the collection of a promissory note. This time the plantiff was a William H Upton. The case as again in Walla Walla County. Amasa was the father of Charles Galloway and the grandfather of Elsie (Galloway) Hamilton. From this record it appears that Amasa Galloway sued A.B. Robley for personal property damages in Walla Walla County. Amasa was the father of Charles Galloway and the grandfather of Elsie (Galloway) Hamilton. 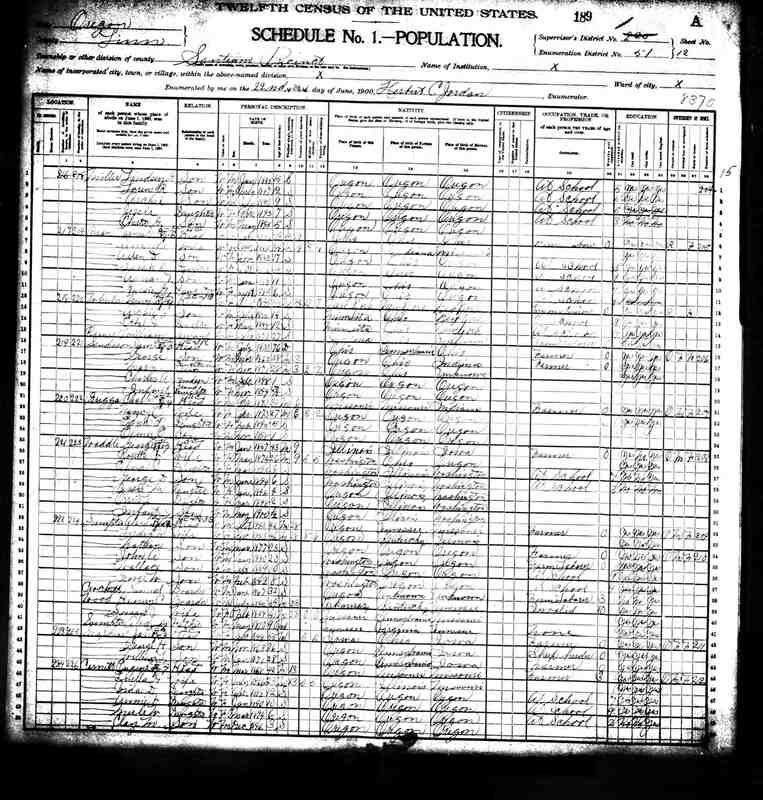 This is a page from the marriage records of the King County minister Daniel Bagley courtesy of the Wash. State Digital Archives. This page records the marriage of Amasa Galloway to Elizabeth Jordan in Nov. 1870. 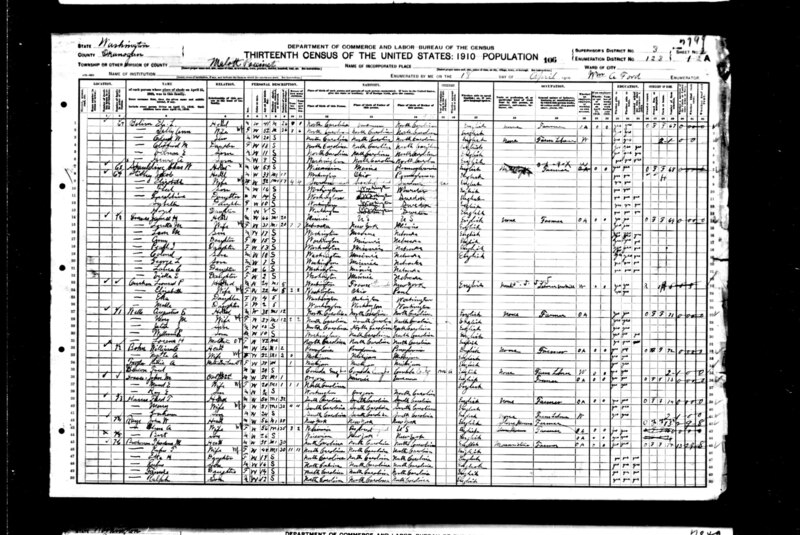 It also records the marriage of Elizabeth's sister, Eliza Ann Jordan and John Blonquist on May 3, 1871. Amasa and Elizabeth were witnesses. In addition, the marriage of another of Elizabeth's sisters, Martha Jordan to Robert N. Canaday is recorded on May 18, 1871. Her married sisters, Elizabeth Galloway and Eliza Blonquist were witnesses. This article also mentions Elsie Galloway. Elsie was the granddaughter of Amasa and Elizabeth Galloway and the wife of Maurice Lake Hamilton. This article appears in the book: Trails and Tales of The Early-Day Settlers Of North-Eastern Okanagon County Washington. 27) Amasa Galloway's first wife: M. E. Cummins? 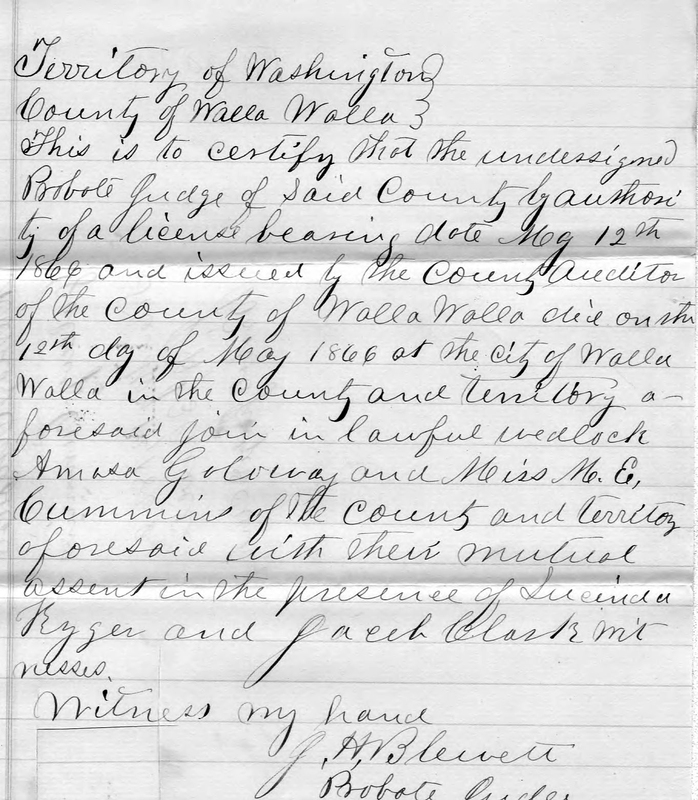 The Washington State Digital Archives has published the handwritten May 12th, 1866 marriage certificate of Amasa Galoway (Galloway) and M. E. Cummins. Married apparently at the courthouse in Walla Walla in the presence of two witnesses. This is a very large but interesting download. It is 9.5mb (so it will take awhile to open). It is a PDF file. This history work gives us a couple glimpses of Supplina Hamilton. Annettie (wife of Judd Hamilton) stayed in Nespelem with the younger children while Judd (age 47) and Ross (age 24) worked outside the home in Omak, Wa. Annettie kept the store the family had in Nespelem, The Blue Goose. Annie R. Ramsay was the wife of William H Foley and the daughter of James W. Ramsay and Mary A. Spaulding. She was the sister of Lillian Ramsay who was the mother of Elsie (Galloway) Hamilton.